Ordinary extension ladders are heavy; and always have been. The leading cause of extension ladder injury is linked to the weight of the ladder—often resulting in torn rotator cuffs, herniated disks, ankle sprains and knee ligament tears from loading and unloading or carrying heavy traditional extension ladders. These injuries have simply been part of using extension ladders, until now. 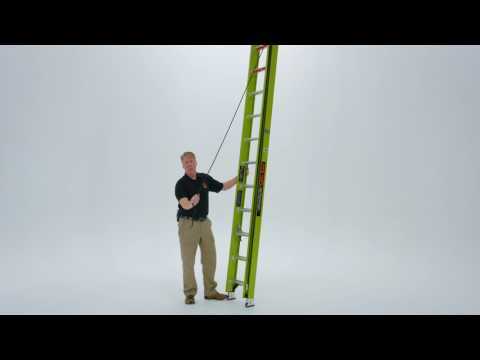 Introducing a revolutionary new product in the lightweight ladder industry. The Little Giant® HyperLite™ lightweight ladder is the lightest Type IA and IAA fiberglass extension ladder in the world, bar none. The patent-pending HyperLite lightweight ladder weighs up to 40 percent less than the leading competitor’s standard fiberglass ladder without sacrificing strength and stability. The HyperLite’s wide rungs provide great comfort, reducing foot fatigue and are very easy to replace. It also features Little Giant’s unique side-mounted, dual-pulley system, which reduces the effort required to lift the fly section by 45% and removes a potential trip hazard caused by traditional center-pulley rope systems. The patent-pending Sure-Set™ foot allows you to set the feet in either flat or spike positions and have them stay in place. Little Giant’s patent-pending hi-viz green rail is one of the most easily detected color hues to the human eye. Why does a lightweight ladder need to be hi-viz? Some of the most catastrophic falls are caused by people who walk or drive into an extension ladder in use. Extra Heavy Duty Type IA – 300 lbs: 16’, 20’, 24’, 28’, 36′ and 40′. Special Duty Type IAA – 375 lbs: 16’, 20’, 24’, 28’ and 32′. * Based on tests performed in a controlled ANSI-compliant test lab. Suggest heavier/stronger springs for rung locks and flippers. I train/certify new employees on ladders, some of which are quite used, and see loose springs all the time. Thanks James! We are glad you like your HyperLite! I'm a window washer and the lean-to position helps me get really close to the windows. It makes my job go a lot faster! Weight Capacity 300 lbs. 375 lbs. 300 lbs. 375 lbs. 300 lbs. 375 lbs. 300 lbs. 375 lbs. 375 lbs. 300 lbs. 300 lbs. Extension Min. Height 9 ft. 9 ft. 11 ft. 11 ft. 13 ft. 13 ft. 15 ft. 15 ft. 16 ft. 18 ft. 20 ft.
Extension Max Height 14 ft. 14 ft. 18 ft. 18 ft. 20 ft. 20 ft. 26 ft. 26 ft. 30 ft. 33 ft. 36 ft.
Extension Max. Highest Standing Level 9 ft. 5 in. 9 ft. 5 in. 13 ft. 3 in. 13 ft. 3 in. 17 ft. 1 in. 17 ft. 1 in. 20 ft. 10 in. 20 ft. 10 in. 24 ft. 9 in. 27 ft. 7 in. 30 ft. 5 in. Storage Height 8 ft. 8 in. 8 ft. 8 in. 10 ft. 8 in. 10 ft. 8 in. 12 ft. 7 in. 12 ft. 7 in. 14 ft. 7 in. 14 ft. 7 in. 16 ft. 6 in. 18 ft. 5 in. 20 ft. 4.5 in. Storage Width at Base 1 ft. 5.5 in. 1 ft. 5.5 in. 1 ft. 5.5 in. 1 ft. 5.5 in. 1 ft. 5.5 in. 1 ft. 5 in. 1 ft. 5 in. 1 ft. 5 in. 1 ft. 5.5 in. 1 ft. 5.5 in. 1 ft. 5.5 in. Storage Depth 6 in. 6 in. 6 in. 6 in. 6 in. 6 in. 5.8 in. 6.1 in. 6 in 6 in. 6 in. Rung Size Single Section Inner: 1.5 in. Outer: 1.5 in. Inner: 1.5 Outer 1.5 Inner: 1.5 in. Outer: 1.5 in. Inner: 1.5 Outer 1.5 Inner: 1.5 in. Outer: 1.5 in. Inner: 1.5 Outer 1.5 Inner: 1 in. Outer: 1.5 in. Inner: 1.5 Outer 1.5 Inner: 1.5 in. Outer 1.5 in. Inner: 1.5 in Outer: 1.5 in. Inner: 1.5 in. Outer: 1.5 in. Rung Size Double Section 4. in 4 in. 4 in 4 in. 4 in 4 in. 4 in 4 in. 4 in. 4 in. 4 in. Max Base Width 1 ft. 5.5 in. 1 ft. 5 in. 1 ft. 5 in. 1 ft. 5 in. 1 ft. 5 in. 1 ft. 5 in. 1 ft. 5 in. 1 ft. 5 in. 1 ft. 5 in. 1 ft. 5.5 in. 1 ft. 5.5 in. Ladder Weight 30.6 lbs. 31 lbs. 37.3 lbs. 38 lbs. 44.27 lbs. 45 lbs. 51.2 lbs. 52 lbs. 62 lbs. 70 lbs. 77 lbs. w/Cable Hooks & V-Rung 34.1 lbs. 34.5 lbs. 40.8 lbs. 41.5 lbs. 47.87 lbs. 48.6 lbs. 55.7 lbs. 56.5 lbs. 65.6 lbs. 73 lbs. 80 lbs.